52 weeks. 52 new things to do. I’m officially now a devout homemade ice cream person. The conversion took all of a week and some fun nights with friends hanging out making ice cream. For those that may be interested I’m pretty happy with the machine I got. When asked if I would have preferred having an electric one or the hand crank, I would still go with the hand crank. 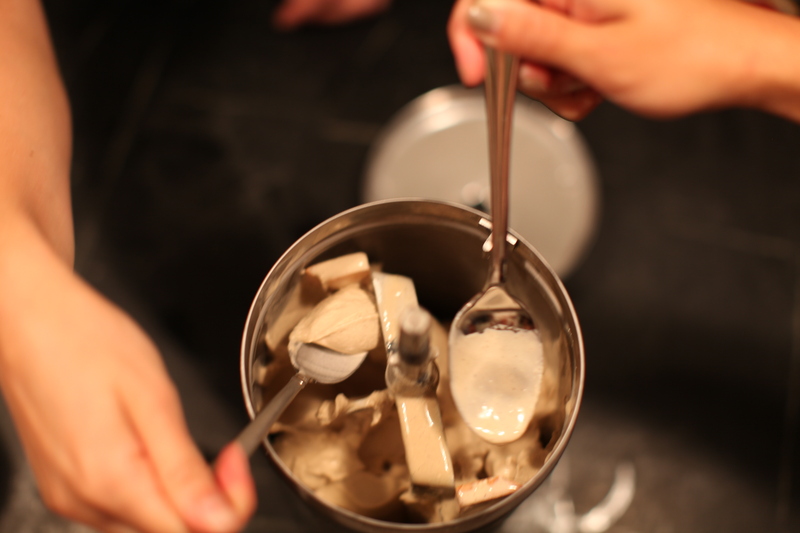 It’s a little more work, but you really feel like you’re making ice cream. I think it tastes even better from all the manpower you put in. 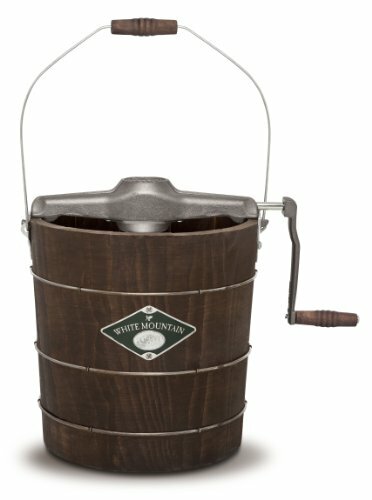 The ice cream maker I’ve been using is the White Mountain 4qt. hand crank machine. I purchased it for $169.95 at McGuckin in Boulder which is hands down the best local hardware store I’ve ever been in. I think the 4 qt is a perfect size because you can definitely make enough ice cream for anywhere from 2-15 or so people to enjoy. Unless you’re making serious batches I think it’s a good size. It’s a bit of an investment, but White Mountain has been in the business for 150 years and guarantees their product. I can foresee many fun Summer nights of ice cream making to come that will more than justify the expense. 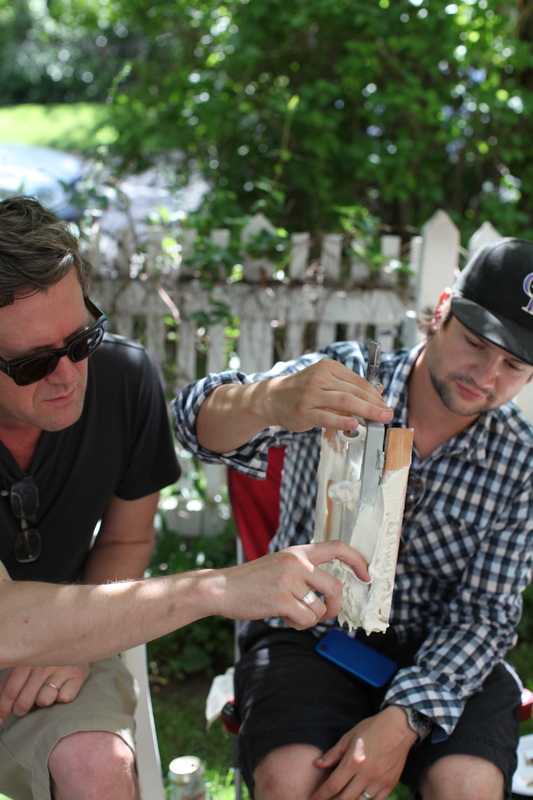 Part of this project is about going local and knowing what good stuff there is around in Boulder. The great thing about making ice cream is that you can really tap into the wonderful Summer produce. In this case I tapped into some Colorado cherries. I also used goat cheese from a local producer called Haystack Mountain. We love buying their different cheeses from the Boulder Farmer’s Market. Goat cheese ice cream may sound a little strange at first but this was yet another amazing recipe from Jeni’s recipe book. She really knows her ice cream. 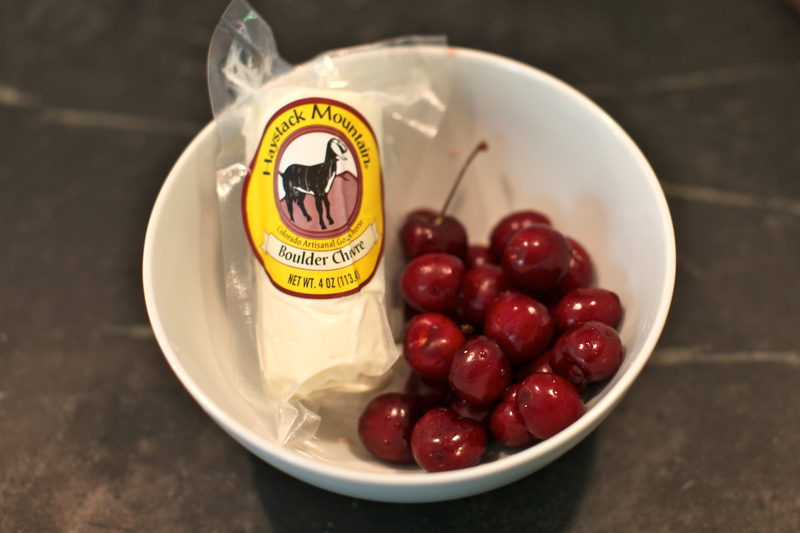 This recipe was for goat cheese ice cream with roasted cherries. The recipe also pairs well with figs in the Fall. I will be trying it again. The result reminded me a lot of the cream cheese filling in a cheese danish in terms of flavor. It was way more decadent though and rich. 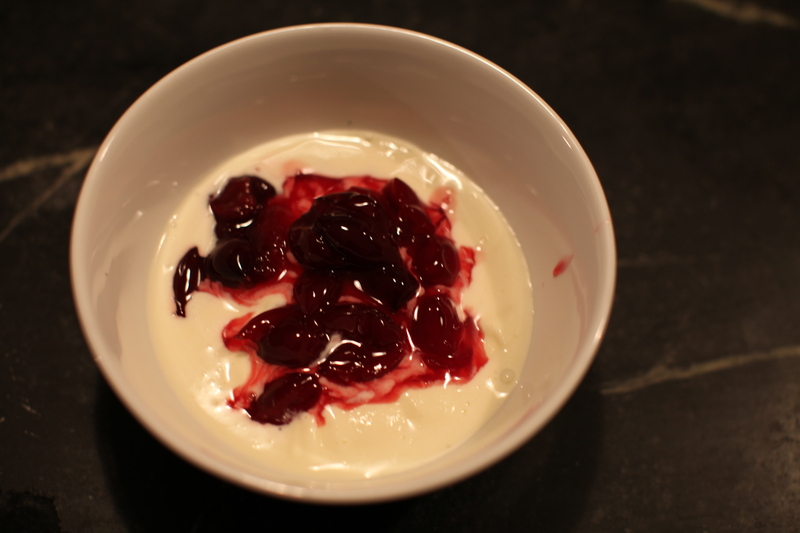 The cherries were a nice tartiness to soften the richness a bit. It really started melting quickly once we got it out of the canister. It was still delicious nonetheless! 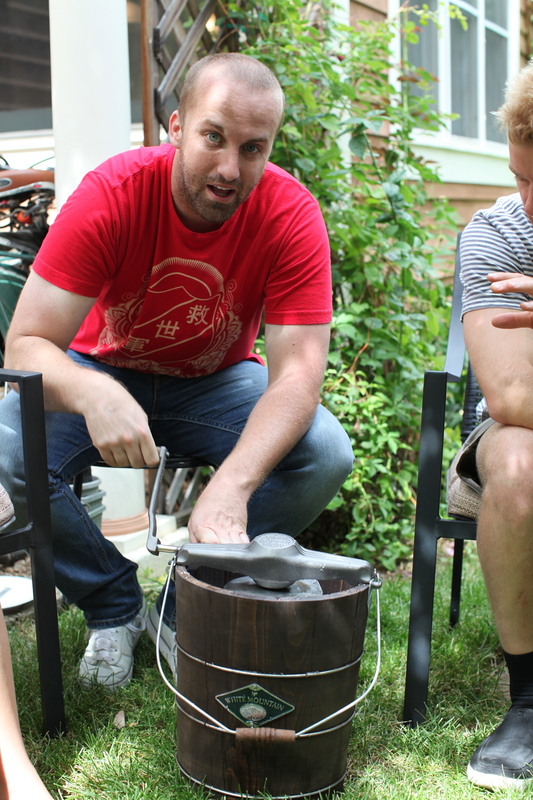 Last night combined two of my new favorite things, home roasting coffee and hand cranking ice cream. Ok, maybe the hand cranking isn’t my favorite thing, but with friends it’s not so bad and the result is pretty fantastic. We started out by stovetop roasting a batch of Rwandan coffee to a semi-dark roast. You can check out more info here about home coffee roasting from when I did that week in early January. 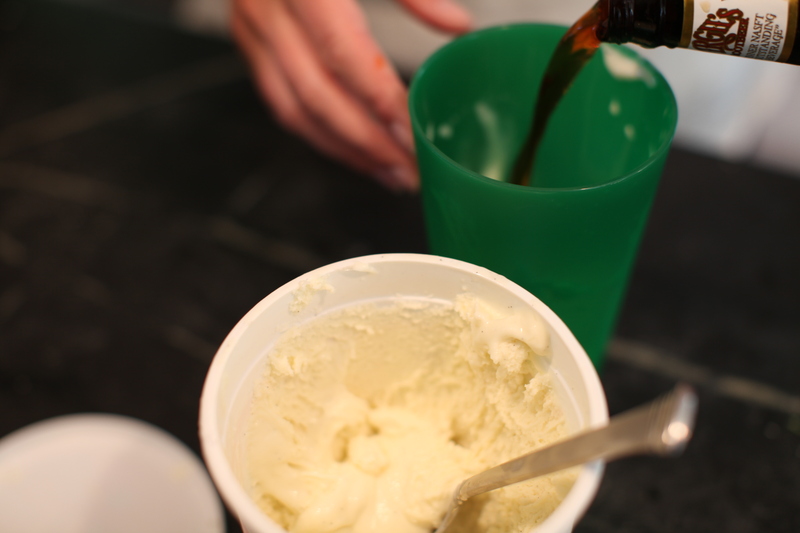 We then added the grounds to the basic ice cream base from Jeni’s Splendid Ice Cream at Home, following her recipe for dark roast coffee ice cream. Talk about a delicious smell. 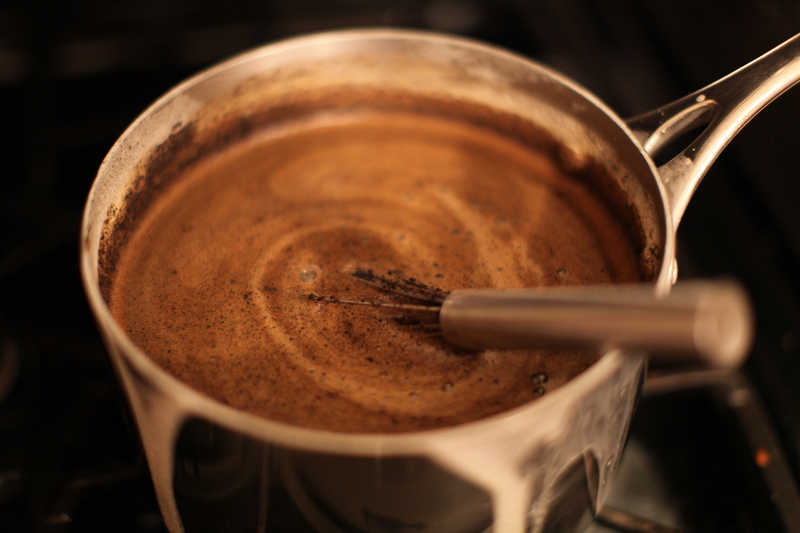 Fresh roasted coffee, cream, sugar…pretty divine. Unfortunately there was still a lot of work to be done to turn it into ice cream. We strained the grounds out, brought it back to a boil adding the thickener (milk and cornstarch) and then added it to the cream cheese and salt mixture. We got to enjoy a little wine break as the mixture cooled in an ice bath. Then it was back to taking turns cranking again. This batch was 2 quarts, so it took us about a half hour to get it cold. We were lacking in some of the manpower we had the other night but we ladies still did the job. My friend Jess was not to be daunted by how difficult it got towards the end. I tried to be patient but my desire to try the ice cream finally took over from powering through. Once we were finished the result was once again pretty darn awesome. I think it will be a lot of fun to continue to try different beans and roasts making homemade ice cream. You can really taste the oil and flavor from the beans, so it will be interesting to see how different varieties work. Tonight I’m going to be trying out a locally inspired ice cream recipe. I’m sticking with Jeni’s book because so far it’s led to some pretty fantastic ice cream. No need to mess with a good thing. 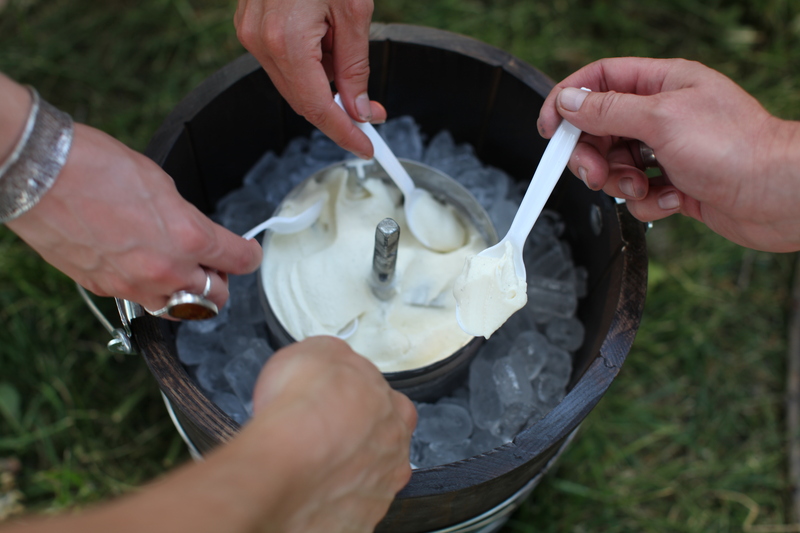 If you have never made homemade ice cream, you must go out next weekend and invest in an ice cream machine. Making my own ice cream reminds me a lot of roasting my own coffee. It blows the store bought stuff out of the water. It just has so much more flavor. I’m glad we opted for the hand crank machine. 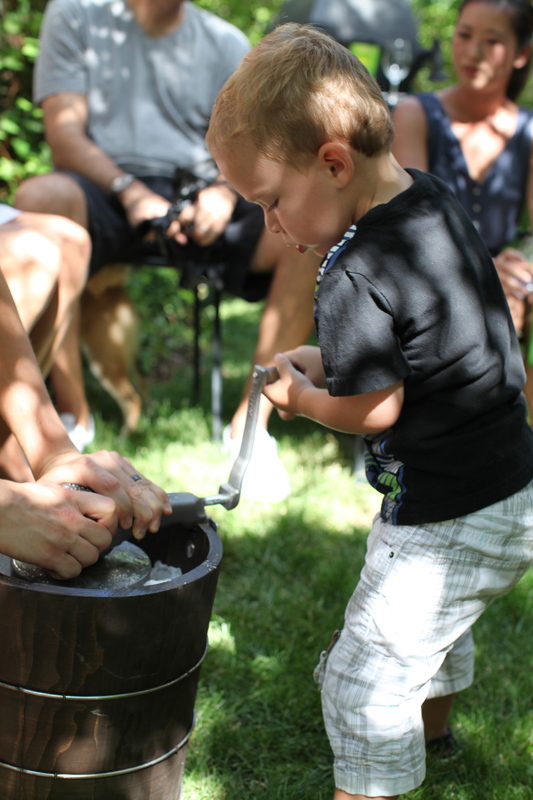 Not only does the ice cream taste amazing but it’s a lot of fun for a BBQ. If you have kids, it will keep them entertained for a good hour or so. We had fun taking turns and I’m glad I was on the earlier shift. It definitely gets a lot harder towards the end. We weren’t sure how long it would take but it took about 20 minutes for 3 quarts. You know it’s ready when you pretty much can’t turn it anymore…no matter how big and strong you think you are as my husband found out on the last shift. 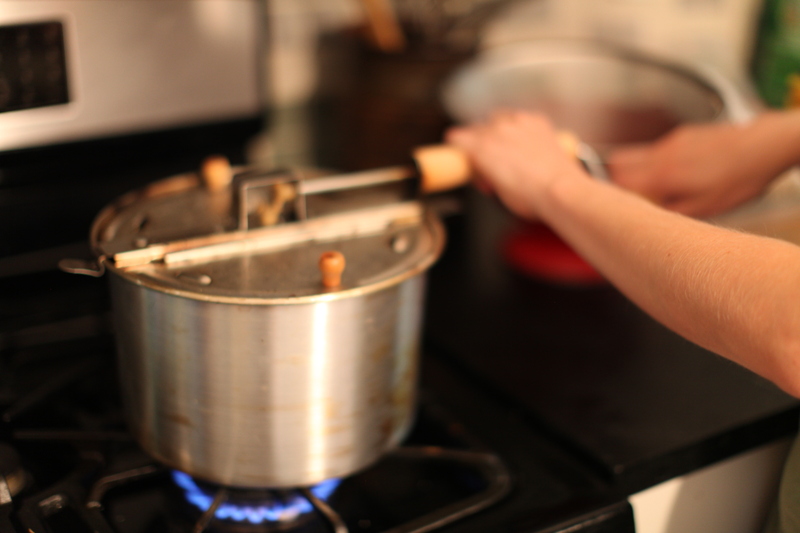 It’s so rewarding to dip your spoon in right when it’s done. 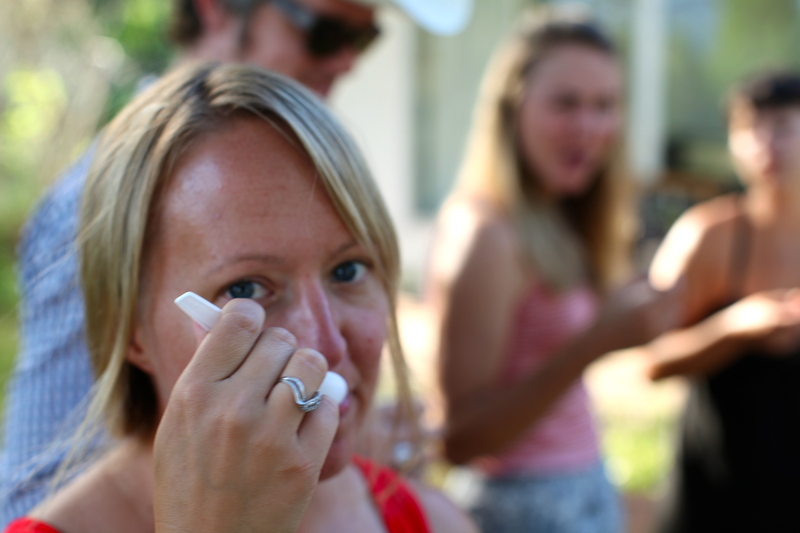 It’s like you’re eating ice cream for the very first time. I seriously don’t know if I could go back to store bought ice cream after this. And to top it off, we had a wonderful baker in our midst who made one of the most delicious pies I’ve had in a long time to go with it. Strawberry rhubarb pie with home made, cranked vanilla ice cream. Now it’s time to burn it off at the pool. 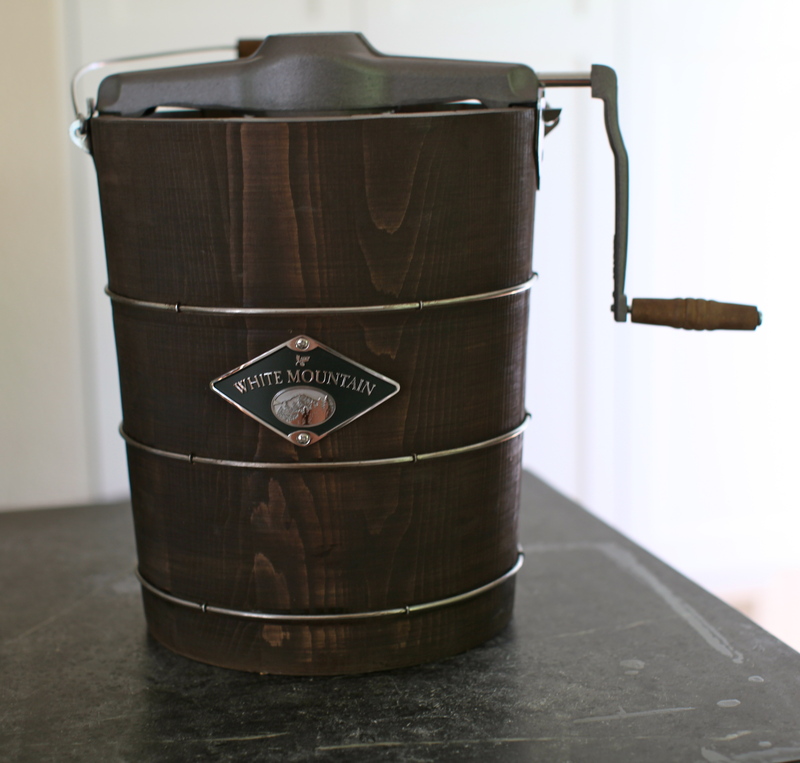 I’m now the proud owner of a hand crank ice cream maker. I’m building a nice arsenal of all kinds of old school kitchen supplies. I went for the hand crank over the electric one for a couple of reasons. First, it fits better with my interest in craft and learning how to do things from scratch. Most importantly, I figure if it’s a little more work, I won’t do it quite as often. 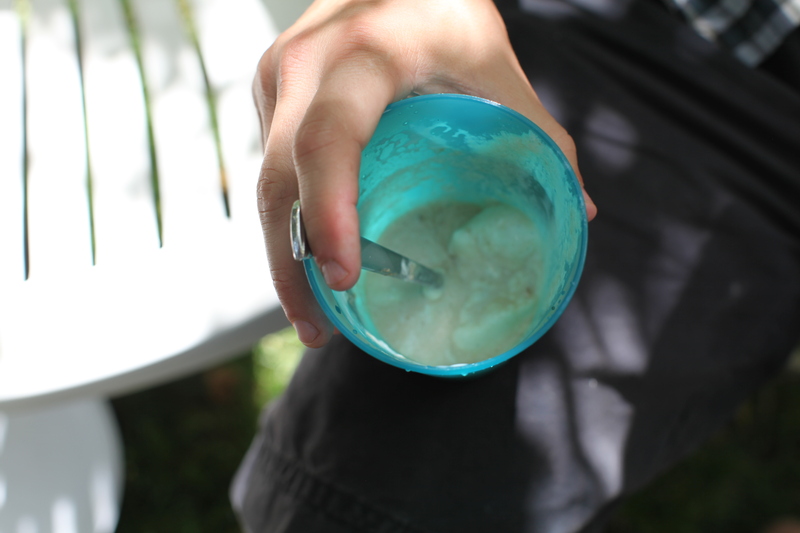 I have a feeling homemade ice cream could become a seriously addictive habit. I’ve never had homemade ice cream before but it seemed like such a perfect fit for this week with the Fourth of July and all. We’re going to a BBQ at a friend’s house later on and there will be many hands on deck to put to good use making ice cream. I’m imagining it will be much like our ice fishing excursion taking turns auguring, although with hopefully a much more successful result! And the ice cream will be the only thing freezing. 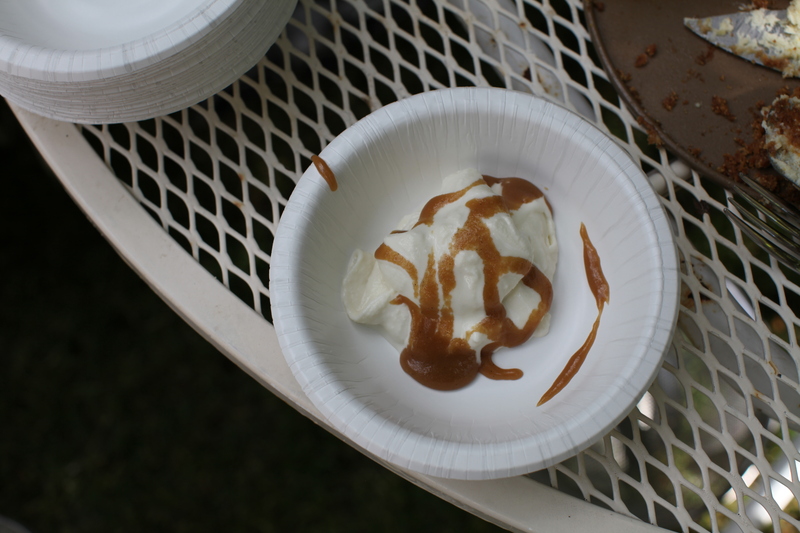 For our first time, we’re going to go with tried and true vanilla ice cream. My friend Jess is going to make a pie to go along with it. She also brought a recipe book by my house that I can already tell is going to make it hard to choose what other flavors to make this week. It all looks so good! You are currently browsing the 27 ice cream! category at 52 To Do.